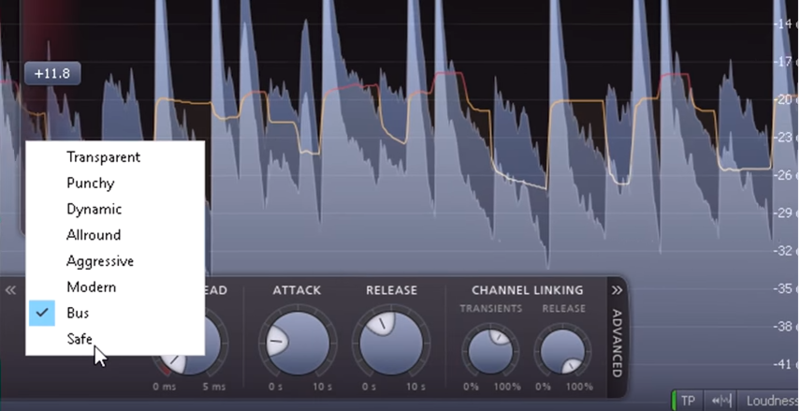 A true peak limiter is an essential tool for every mastering or mixing engineer. 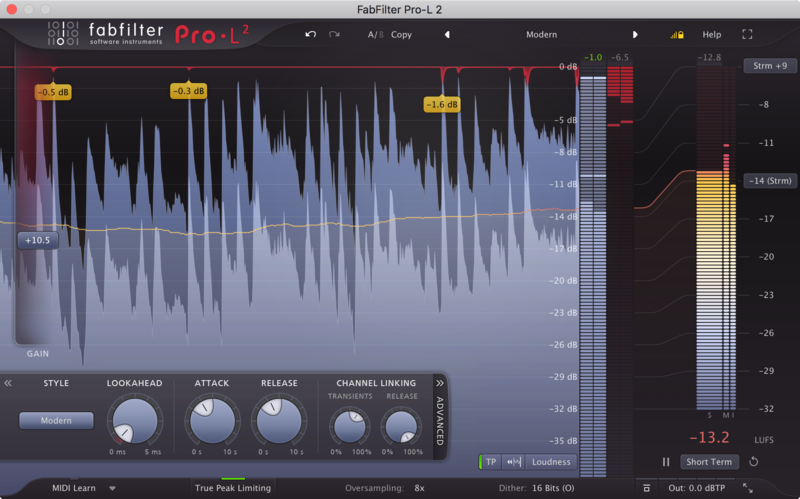 FabFilter Pro-L 2 is a professional, feature-packed limiter that is loud and transparent at the same time. Incredible sound and an intuitive interface, FabFilter Pro-L 2 features precise true peak level meters and extensive loudness metering with support for the EBU R128, ITU-R BS.1770-4 and ATSC A/85 standards. Combined with its unique real-time level display, you have all the information you need to achieve the best possible results. With highly advanced algorithms, linear-phase oversampling, professional dithering, noise shaping, surround sound support, and intelligent channel linking; FabFilter Pro-L 2 is the complete solution for every mixing and mastering job. 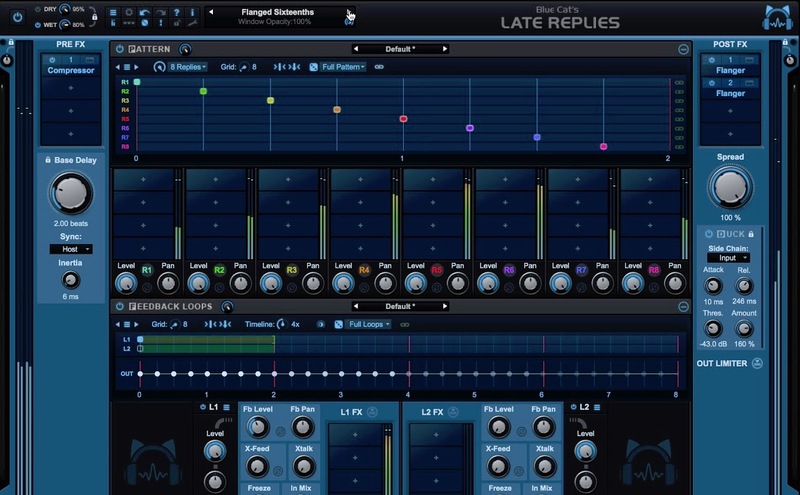 FabFilter Pro-L 2 features perfectly tuned knobs, MIDI Learn, Smart Parameter interpolation for smooth parameter transitions, an excellent help file with interactive help hints, SSE optimization, GPU-powered graphics acceleration and much more. 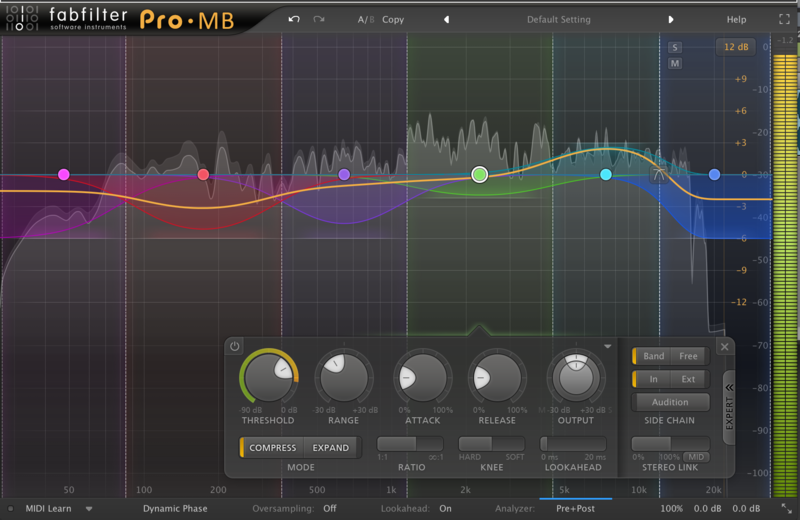 A major new update for the FabFilter mastering limiter, Pro-L 2 adds new limiter styles such as Modern, Aggressive, Bus and Safe. Pro-L 2 also adds new display options such as the ‘slow down’ mode. A True Peak limiting button has been introduced, when this is turned on Pro-L 2 will catch inter-sample peaks even without any over-sampling for the audio path. Pro-L 2 also provides an external side chain input, which allows you to apply brick wall limiting to a full mix, while splitting it into multiple stems. The Pro-L 2 interface allows for the user to have separate control over the stereo linking for each limiter. If you reset the display before the start of the song, it will build up to show a loudness graph for the whole song, or even a whole album if you leave it running. With multiple different display modes such as full screen mode or compact mode, the user gets full control of how they would like to integrate Pro-L 2 into the aesthetic of their work station. 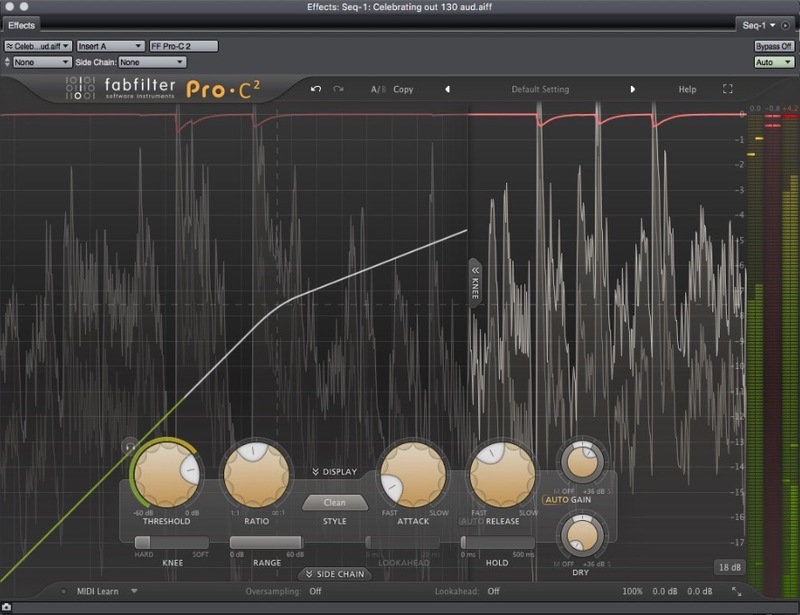 FabFilter Pro-L 2 is available in VST, VST3, Audio Units, AAX Native and AudioSuite formats (all both 64-bit and 32-bit), as well as RTAS (32-bit only). FabFilter’s Pro-L 2 is top notch. 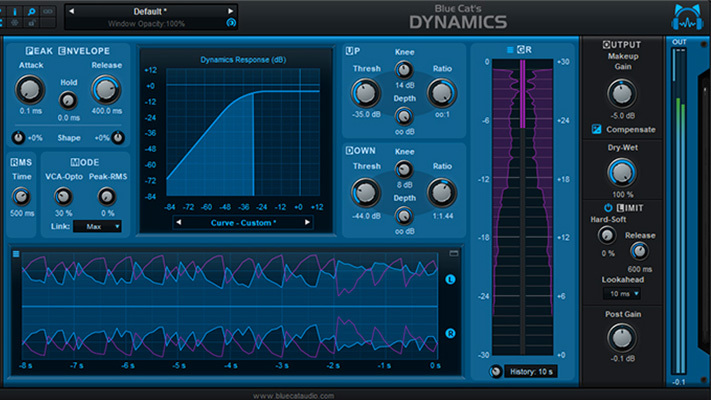 A powerful plug-in that will be sure to make your tracks sound better. The interface is extremely comprehensive. A great thing about this plug-in is that anyone can open it up and start using it right away. The help function is detailed and very useful. If you are unsure as to what a button means or its function, it is as simple as hovering your cursor over the button and the information that you seek will come up. 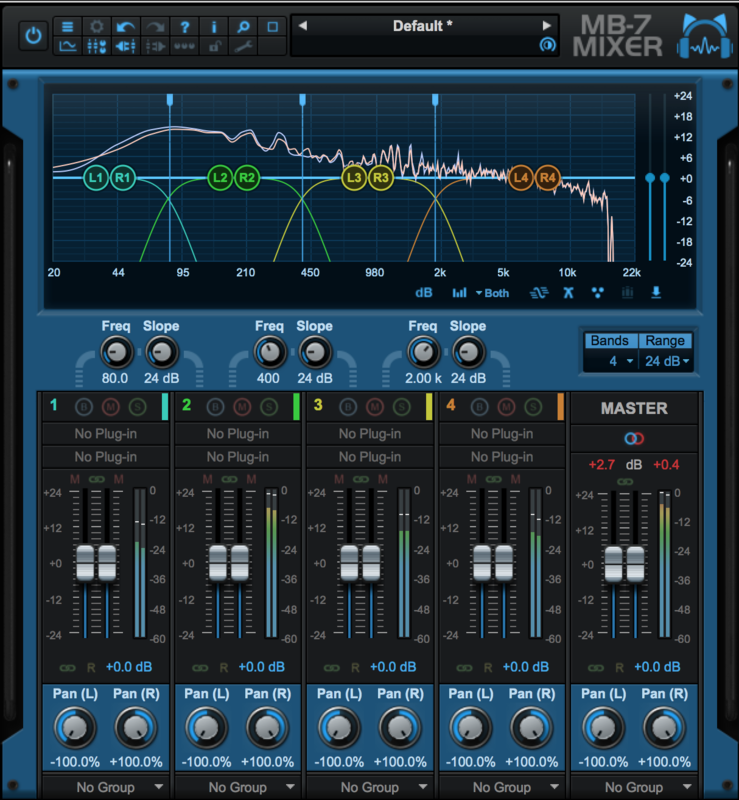 This is very useful to someone who is just getting into the practice of mixing and mastering. One thing I found useful in Pro-L 2 is the display mode options. Display mode has 4 options, slow down, fast, slow, infinite. Slow down, the display scrolls very slowly, and moves all drawn data to the left once in a while when it reaches the right end of the display. Fast, the traditional mode of Pro-L 1, level data originates from the right of the display and scrolls to the left. Slow, same as fast mode but at half speed. Finally, my personal favourite, infinite. Infinite, the data is written from left to right, when the right of the display is reached by the data, the data is ‘compressed’ to half of its size, and new data will be written at half speed. This mode is my favourite as it allows you too see the full picture. What I mean by that is, the mode is perfect to display integrated loudness measurements over a longer period of time. The mode gives you more information without having to scroll. It is the perfect setting if you are using the plug-in full screen. An advantage that Pro-L 2 has is its quality presets. The presets found within the program are genre specific and titled to capture the character and vibe of the desired sound. 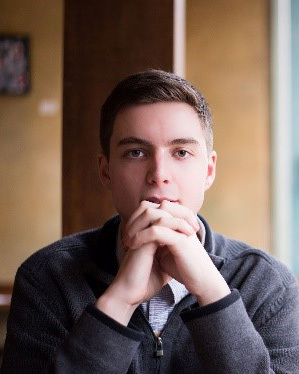 For example, the track I am working on is a soft rock song, I utilized the preset ‘soft rock – tight and wide,’ this preset captured the essence of the sound I am going for and after a few custom adjustments I began to find an overall sound I was happy with. The style button is what allows the presets to capture specific character and moods. The style button has 8 options: transparent, punchy, dynamic, allround, aggressive, modern, bus, safe. Personally, my favourite style is dynamic. I found that this style brought out percussive elements to the track more than some of the other styles. For example, the track that I am working on has a drum fill at the end of every 16 bars. The fill is full of tom work, specifically high tom work. I found that the style, dynamic, really made the high toms present in the mix, giving a lot of unique character to the track that I did not hear when using plug-ins that weren’t the Pro-L 2. In addition to a great display and 8 distinct and useful styles, 3 things really impressed me with FabFilter’s Pro-L 2. Firstly the ‘dithering’ button, I found that just through a simple click of the button, the quality of my track increased. The dithering button helped to preserve detail and resolution by reducing quantized distortion. I found this very useful and also very easy to do as it just took a click of a button and an attentive ear. Secondly, the ‘true peak limiting’ button I found added a level of quality to my track I have not been able to capture through any other plug-in. The ‘true peak limiting’ button will ensure that the limiting process takes true peaks into account, and the final (true peak) output level will not exceed the currently used maximum output level. Finally, my favourite feature of FabFilter’s Pro-L 2 is the a/b button. I personally think every plug-in should have a button of this nature. It seems like such a simple button, but I love the concept of it as well as the use of it. The a/b button allows you to have two instances of Pro-L 2 running, allowing you to easily compare different settings and how they impact your track. I find this to be extremely useful to really be able to get the sound you desire. Overall, I was really happy with the easy of use of the Pro-L 2. 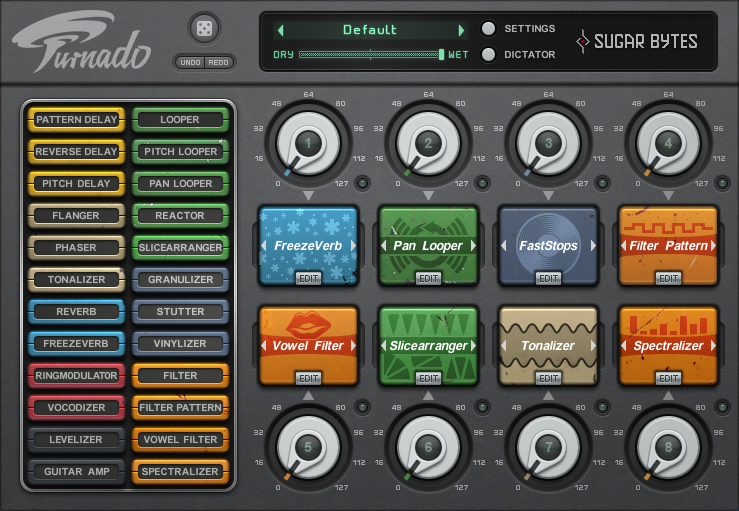 Not to mention, all the great features, presets, and modes that allow you to have complete control over the track you are working on. 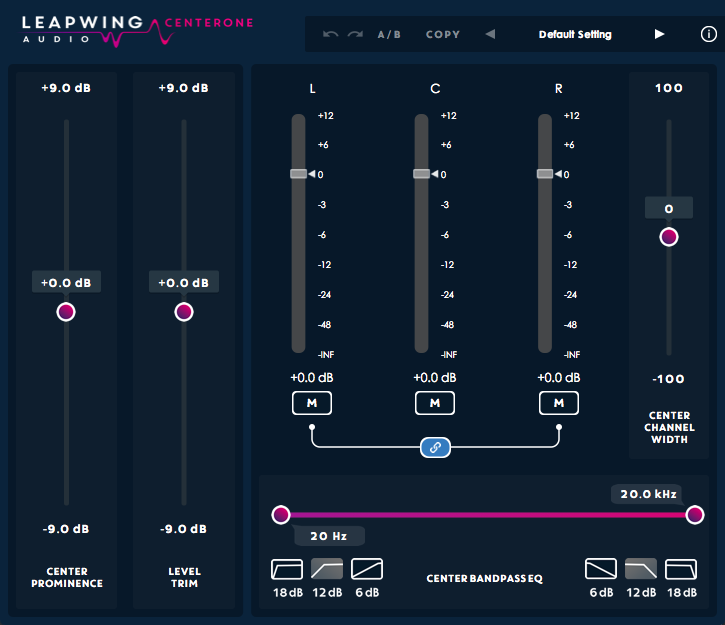 At a decent price point, I highly recommend this plug-in for anyone who is mixing or mastering on a professional level, or anyone who wants their sound to be taken to the next level. For more information, please check out caminojazzclub.com.